First off, I hope you had a very Merry Christmas/Happy Holidays! Can you believe that the New Year is right around the corner?! I have big plans for 2014 and need to make sure that my creativity keeps flowing. Sometimes I get into a creative rut where I want to make something or design something, but just can’t produce. So frustrating. I have the urge, but nothing more than that. When I start feeling like this I turn to this list, and depending on the situation, at least one of these usually does the trick. I wanted to share these with you so that 2014 is a creative year for you, as well! Keep an Idea-book: This has to be my favorite way to stay creative, because it consistently gives back. What do I mean? Well, every time I get an idea, I jot it down or sketch it out. More often than not, I can’t get to that idea right away, but I know it’ll be there later. This is perfect, because when those days come around where I feel a creative-block, I turn to my Idea-book. It’s amazing what I find in there; Stuff that I completely forgot about. This gives me the kick in the tail that I need nearly every time. Research an Artist: I find it very inspiring to research one of my favorite artists, musicians, photographers or actors when needing a creative boost. I don’t just mean to look through their works (although that helps, too). I actually pull up their bio and read their story. What makes them tick and how far have they come in their creative process? I’m not wanting to compare, just trying to get an in-depth look at who they really are. Sometimes this triggers something in me. It can surly spark an idea for you, too. Venture Out to Your Favorite Store: Whether you’re a fashion designer, a painter, a photographer or a thrifter, you have a favorite store. Think for a minute, why is it your favorite? Probably because it inspires you in one way or another. For me, I have a few favorite stores that inspire me in very different ways. Just looking around a Hobby Lobby, JoAnn’s or Michael’s craft store make me want to create. I don’t even have to buy anything, just the act of looking around fuels me. I also really enjoy stores like Ikea, Anthropologie, Urban Outfitters and Free People. Antique shops are also a go-to favorite for me. If you surround yourself with things that you like and that inspires you, creativity will follow. 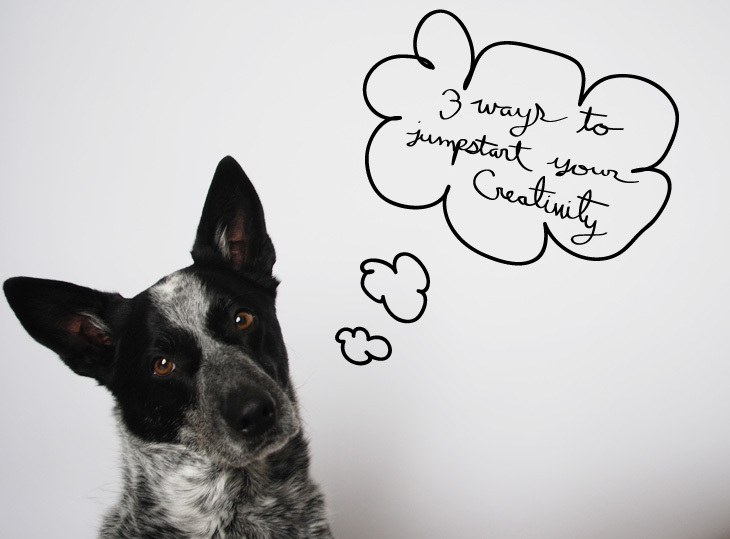 These three ways really jump-start my creativity; what works for you? Feel free to share in the comments below. P.S. Meet Tucker Bean; He’s one of my beautiful Blue Heeler Pups! Sometimes he’s lazy, but generally all he wants to do is play fetch. He’s also the baby in our family and his favorite time of day is bedtime.